The Lobster Tennis company has been manufacturing tennis ball machines for over 20 years and has developed solid, portable, battery operated tennis ball machines that range from simple to complex. And because of the differences and different options on each one, each machine is designed for a different type of tennis player. And because each model is priced differently, it’s important to find the ball machine that’s right for you. Read on to see aLobster tennis ball machine review that covers some of the different models from Lobster and who they’re designed for. 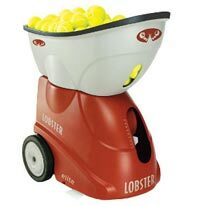 The Lobster Elite Freedom is the introductory model of tennis ball machine from Lobster. It is economically priced and offers the basics plus a little more. The machine offers speed control, ball frequency control, top and back spin, plus overhand practice that pretty much any portable tennis ball machine will provide. Then the Freedom also has an oscillation feature that will place the ball across the court to give you a chance to practice approach shots and give you a great work out. The Lobster Elite 3 is the middle tennis ball machine model that has all of the basic features but a lot more. The Lobster Elite 3 has all of the features of the Freedom but also includes a vertical oscillation as well as an enhanced horizontal oscillation that will shoot the balls narrow and wide so that you can get doubles practice as well as practice judging whether a ball will fall out of bounds or not. The Lobster Grand Slam V is the top of the line tennis ball machine. This Lobster ball machine has all the basics plus a ton of bells and whistles that are designed to challenge the most talented players. In addition to everything that the Elite 3 has, the Grand Slam V comes pre-programmed with several drills that are designed to work on the most challenging parts of a players game, it also has the ability to be programmed so that you can practice weakest or most troublesome parts of your game. Plus, it can be configured with a remote control that allows you to switch up what you’re doing whenever you want.